Well, hello Weekenders! Hey, let’s sit you down for a second. You’re probably not going to believe this, and I’m truly sorry for forgetting to tell you earlier, and we certainly don’t have time to find a dress at this point, so what you’re wearing is gonna have to be fine, but here it is: You (deep breath) have been nominated (dramatic pause) for best performance in a weekend! And I have to tell you: I’ve got a good feeling about this. Me? Oh, no, no; I’m flattered, but no. I’m just the director here. Besides, I don’t do the Weekender for the glory — though there is no shortage of glory, let me tell you — I’m merely here to supply the space for the stars (i.e. : Y’all). ROPES COURSE: Is wrestling real or fake? What about a movie about wrestling? What about a movie based on a true story about wrestling? My ongoing struggle with the dimensions of artifice are my own to grapple with, but for the rest of you, “Fighting With My Family,” the portrait of WWE champion Paige (Florence Pugh) from director Stephen Merchant, is the real thing — whatever that means. “It’s the mark of many a standout sports movie that you don’t necessarily have to be a fan to enjoy the story,” writes reviewer Tom Russo in his three-star review, “ ‘Fighting With My Family’ is a hugely entertaining case in point.” Extra-recommended if you like Nick Frost with a mohawk, which I have a feeling some of you do. Now screening. DRAGON BALL: “How To Train Your Dragon: The Hidden World” marks the final installment of the trilogy, loosely based on the books by Cressida Cowell, and presumably celebrating almost a decade of making Americans safer from dragons. No spoilers about the hidden world, but the one you can see is pretty stunning. Globe film critic Ty Burr gives it three lightly charred stars, writing that the film has “a visual sumptuousness and a fluid agility that make it worth experiencing even if you’re not paying attention to the story.” (And if you’re not paying attention to the credits, it features the voices of Jay Baruchel, Cate Blanchett, and F. Murray Abraham.) Now screening. 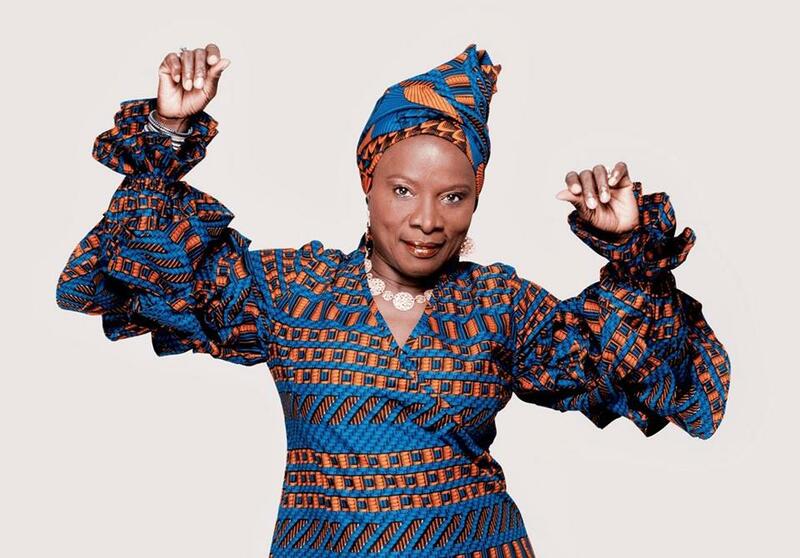 Angelique Kidjo headlines Saturday’s CRASHfest. BOSTON GLOBAL: Saturday’s hot ticket is CRASHfest, the global music festival featuring more than 10 bands from around the world spread across three stages around the House of Blues. Angelique Kidjo headlines with her anticipated full-album performance of the Talking Heads classic “Remain In Light,” but the entire lineup is worth showing up early for (ditto the food trucks). Catch performances from Red Baraat, Tribu Baharú, M.A.K.U SoundSystem, Kotoko Brass,Veronica Robles and Her Female Mariachi Band, the Blue Dahlia, and more. More information and tickets here and here. CAJUN HEAT: For an appetizer course of spicy sounds from out of town, consider a sitdown on Friday night with Michael Doucet and his BeauSoleil, the irresistible purveyors of “Louisiana French Music From Traditional to Modern.” The powerhouse outfit brings its gumbo of Zydeco, bluegrass, country, swamp pop, blues, and fiery New Orleans jazz to the Center for Arts, Natick. Pack a Pepto, wear the right shoes, and grab tickets here. STAND-UP GUY: Over at Laugh Boston on Friday and Saturday, you can catch a set (or three) from comedian and “Workaholics” costar Erik Griffin (a.k.a. Montez Walker), who is still fresh (honest!) off his 2018 Showtime special “AmERIKan Warrior” (and whom you might also recognize as Ralph Carnegie in that network’s gritty ’70s comedy-comedy, “I’m Dying Up Here”). His stand-up specializes in controversial-but-not-really topics ranging from “Black Panther” (“it was just all right”) to the hard work of protest marches (“you gotta find parking”). Grab tickets here. BHANGRA BANGERS: If you already have a deep love of Hindi film and Indian music, or if you’re just among the Bollywood-curious, you really shouldn’t miss the 10th anniversary installment of the South Asian Showdown 2019, the biggest Bollywood/Fusion competition in the Northeast, and one of the most spectacular lightning rounds of the form you’ll ever see. Twelve select teams from around the world will converge on John Hancock Center on Saturday to be judged not just on their elaborate choreography, but costumes, set design, and difficulty. It’ll make your attempt at the wobble at Debbie’s wedding look like . . . well, your attempt at the wobble at Debbie’s wedding. Tickets here. QUIET PLACE: Globe contributor Jenni Todd describes French choreographer Raphaëlle Boitel’s “When Angels Fall” as a “divine dystopia” that “takes a low-level frustration of modern life, like stunted communication, and imagines how it could have contributed to the fall of civilization.” A dark tale of waning humanity and forbidden speech under a mechanical regime, it’s presented by ArtsEmerson and onstage at the Cutler Majestic Theatre through Sunday. Get tickets here. And maybe plan to get ice cream afterward. DRAWN TOGETHER: Isabella Stewart Gardner herself was the first to bring a Botticelli to America, and so “Boticelli: Heroines and Heroes” serves as both a reminder of how ahead of the curve she was, and (more importantly) how chronically behind them the rest of us seem to be. “The show,” writes Globe art critic Murray Whyte, “is in fact about coaxing an elephant lurking in the corner of almost every historical art exhibition out for a good, long look.” In this case, the responses to Botticelli from Boston-based graphic novel artist Karl Stevens tell a far different tale than the artist’s canvases — with the hard daylight of #MeToo pouring in. It’s up through May 19; find more info on the show here. PIT STOP: And finally from the outside world this week, at Symphony Hall you can partake in the Boston Symphony Orchestra’s Casual Fridays series, which this week features Britten’s totes-apropes “Friday Afternoons” (featuring the Boston Symphony Children’s Choir), as well as Boulanger’s “D’un Soir triste” and Debussy’s “Nocturnes.” Saturday’s program joins the latter two pieces with Puccini’s tragic (in the good way) one-act opera “Suor Angelica” featuring Latvian soprano Kristine Opolais and a supporting cast that includes Violeta Urmana, Fatma Said, and the local Lorelei Ensemble. Grab tickets here. ABC broadcasts the 91st Academy Awards Sunday at 8 p.m.
OR STAY IN! It’s Oscar time! The 91st Academy Awards kick off on ABC Sunday night at 8 p.m. Which means we only have a few days left to argue about who should win, who will win, who won’t, and who got snubbed, as well as what the Oscars have against fabulous hair and makeup, why the show still seems soooo looooong, and how nice it is there’s no host. I’m just going to say whatever Ty Burr says because I saw like two movies this year (see: ongoing struggle with dimensions of artifice). Alternatively, there’s a new Chaka Khan album (as well as an overdue apology to my gays for burying the lede). It’s called “Hello Happiness,” it’s an action-packed 28-minute “bundle of joy,” and as long as that doesn’t mean actual baby, I am here for it. And that, my trophy-snatching Weekenders, is all I’ve got in the envelope for you this time around. Maybe cordon off a couple hours to get into that Oscar gown (and watch it with the salsa, you can’t return that thing). However you decide to spend this weekend, make it one you’ll miss come Monday.